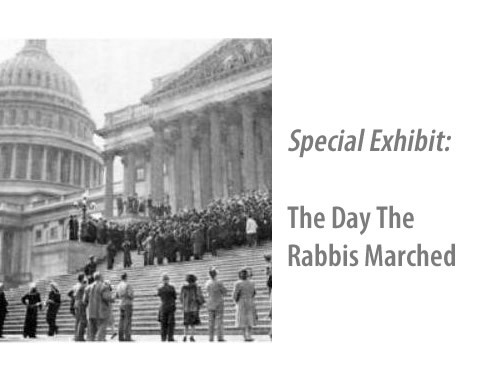 The rabbis’ march on Washington in 1943 actually began the Thursday before the date of this demonstration. The leadership of the Agudath HaRabbonim called a fast day. The primary observance was in Baltimore because there was no adequate Orthodox synagogue in Washington in those days and no community of Orthodox families which could house these rabbis for the Sabbath. Dozens of the most notable figures who were alumni of the leading Yeshivot in Europe took part in the prayers which launched this weekend of imploring God, and the political leaders, to defend and save the Jews under Nazi rule. I was a youngster of 22 who was allowed to be present because the leaders, men who were older than me by a generation or two, were friends and contemporaries of my father, Rabbi Zvi Elimelech Hertzberg. I saw their tears and heard their sobs. They were standing before God and praying for the life and safety of people who were their brothers–and who could have been themselves. I cried among them and I could not stop–not that day and nor for many days to come. On Sunday morning I was given a seat in one of the cars that drove the forty miles from Baltimore to Washington. This was a different kind of rabbinic gathering. These rabbis were not clean-shaven or well-dressed. They were avowedly East European. They represented not “American types” from the posh synagogues. On the contrary, they might just as well have been the rabbis whom Hitler was then putting in death-camps along with their congregants. They were standing at the gate of the White House begging the president to see them and to do something for the Jews who were being slaughtered by the tens of thousands. I could not get up to the fence of the White House so I had to look on from the park across the road. Eventually someone came out of the White House. He took a letter from the rabbis to the president, but the president himself never greeted them. We were soon told that several of his Jewish advisers had told FDR that these immigrant rabbis were not the official leaders of the Jewish community. The people who had put them up to this gesture, such as Peter Bergson and his Emergency Committee to Save the Jewish People of Europe, were opponents of the Jewish establishment. All of us who had been there that day left feeling very bitter; America was our last great hope. If the president of the United States could not take the lead in this effort, or more precisely, if he chose not to be identified with the kind of activist effort that the rabbis were requesting, where could we now go? Was there some other address for our outcry? Or was the outcry being raised at the wrong time? These questions are still being debated to this very day. I continue to feel that the rabbis were right to go that day in 1943 to the gate of the White House. They were right. Those who advised Franklin D. Roosevelt not to see them continue to bear their shame. As a rabbi, author, historian, and Jewish leader, Arthur Hertzberg has been one of the most distinguished figures in the American Jewish community for nearly half a century. 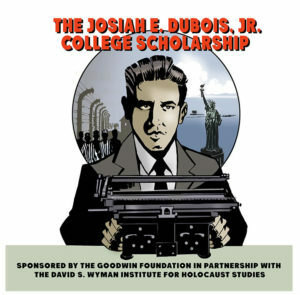 Educated at Johns Hopkins University (B.A., 1940), the Jewish Theological Seminary (ord. 1943), and Columbia University (Ph.D., 1966), his academic career has included serving as a professor of history, religion, and Jewish studies at Columbia, Rutgers, Princteon, Hebrew University, Dartmouth, and, currently, New York University, where he is Bronfman Visiting Professor of the Humanities. His numerous leadership positions in the Jewish organizational world have included president of the American Jewish Congress and vice-president of the World Jewish Congress. From 1956 to 1985, he served as spiritual leader of Temple Emanu-El in Englewood, New Jersey. Prof. Hertzberg’s many books include The Zionist Idea (1959), The French Enlightenment and the Jews (1968), Being Jewish in America (1979), The Jews in America (1989), and The Fate of Zionism (2003), and his recent autobiography, A Jew in America, which won the 2003 National Jewish Book Award. Part 5) Did your father / relative march?